This YES TO SUPERBLUEBERRIES Recharging Greek Yogurt & Probiotic 3-in-1 Mask, Scrub & Cleanser ($15.99/4oz @ target.com) is made especially stressed skin, so basically everyone! I love that this is a multi-purpose face product in that you can use it as a mask (contains the mud Bentonite), an exfoliator (it contains blueberry fruit extract and lactic acids), and a straight up face cleanser. This one dries down almost all the way and it really makes my skin feel nice and soft, which doesn’t happen with many cleansers like this. My first ever micellar water was Bioderma Solution Micellar and it achieved cult status rather quickly and it seems like it was some time before another one came along like this one and this one. So what exactly is micellar water and why should I care? It's tiny balls of cleansing molecules called micelles suspended in soft water. It won't dry or strip the skin and they clean beautifully. Now they won't remove waterproof mascara but they do a nice job otherwise. I’m starting a new on-going feature here on the site called Get Acquainted With … where I spotlight a brand, ingredient or trend I think you should be aware of. First up is Argania Spinosa Kernal Oil, also known as Argan Oil. Argan Oil is a plant oil produced from the kernals of the argan tree that is andemic to Morocco. It can be used to help heal burns, in foods like to dip breads and on salads. In beauty it is known for its super moisturizing properties, to help with juvenile acne and of course in hair and body products. Source: Wikipedia.org. 1. YES TO BLUEBERRIES Face & Neck Oil $15.99/1oz @ walgreens.com. 2. BOTANIC ORGANIC Pomegranate & Argan Antioxidant Serum $30/1oz @ botanicorganic.com. 3. DERMORGANIC Leave-In Spray Therapy $19.99/3.4oz @ target.com. 4. NAIR 'Shower Power' Max with Moroccan Argan Oil $8.99/13oz @ walgreens.com. 5. HERBAL ESSENCES Moroccan My Shine Nourishing Shampoo and Nourishing Conditioner $4.49/10.1oz each @ walgreens.com. 1. JOSIE MARAN 100 Percent Pure Argan Oil $16/.5oz, $48/1.7oz, $96/5oz @ sephora.com. 2. ACURE ORGANICS 100% Certified Organic Argan Oil $14.99/1oz @ walgreens.com. 3. SHEA TERRA ORGANICS 100% Organic Moroccan Argan Oil $24/2oz @ walgreens.com. You NEED These DeFrizz Products! It’s as humid has humid can be out here in SoCal and strands are just not behaving but who wants to wear their hair up all the time? Yes, it feels good on the neck but I just got a cute new cut that I want to show off so a serious defrizz product is in order! Check out the below recommendations to rock you do to the fullest this month. YES TO COCONUTS Curl Defining Hair Smoother ($7.99/3.8oz @ target.com) – choose this one because it has nourishing avocado and coconut oil plus Cupuacu Butter. HERBAL ESSENCES Moroccan Me a Miracle 7-in-1 Serum ($4.49/1.7oz @ bedbathandbeyond.com) – this one is the case of, “if it smells good, it must be good,” and in this case, it’s true. L’OREAL EverSleek Sulfate-Free Smoothing System Frizz Taming Crème Serum ($8.99/1.9oz @ lorealparis.com, walgreens.com and drugstores nationwide) – I’ve never heard of sulfates inside a frizz-taming serum but as we all know, ingredients can disguise themselves under other loooong names. SALLY HERSHBERGER Hyper Hydration Spray Serum ($12.99/1.7oz @ drugstore.com) – this is the only one outta the bunch that you use after hair is dry. It uses SMART Keratin to give hair shine with no, and I mean none what-so-ever, greasy look or feel. KARECO Large Thermal Brush ($22.50 @ kareco.com) – yes believe it or not the right brush can also help cut the frizz. This one is made with Ionic Tourmaline technology so this one coupled with one of these serums will leave your hair smooth as a baby’s bottom! Pillow Proof Blow Dry Two Day Extender ($18/3.4oz) and Pillow Proof Blow Dry Express Primer ($22/4.7oz). Both @ drugstore.com. So I think this past Wednesday was the first Spring feeling day we’ve had here in Los Angeles this year. Yeah, it’s here! So of course I have been reaching for more spring-y type scents and here are a few I’m loving right now. CRABTREE & EVELYN Lily of the Valley Eau de Toilette ($45/3.4oz @ beauty.com) – Lily of the Valley is one of my favorite flowers and I love that they just put out this Floral Fragrance Collection for Spring. It’s a collection of single note scents (Lavender, Rosewater and Iris are the other launches) and the scents also comes in the form of triple-milled soaps, body lotions, candles, shower gels, body creams and a nice body dusting powder. AROMAFLORIA Foaming Body Wash with Shea Butter and Body Butter with Shea and Aloe in Kiwi Coconut ($20/8oz @ aromafloria.com) – What better way to get your season on then with the smell of kiwi and coconut? These two are from their Sensory Fusion Bath + Body Collection and put me in a tropical frame of mind. CUPCAKE ORGANIC Raspberry Rose Blossom Softening Day Cream ($24.67/1oz @ cupcakeorganic.com) – Mmm Rose Blossom, Ylang Ylang and Mandarin are combined inside this ECOCERT Certified day cream. This doesn’t have any SPF inside so be sure to load up when you wear this one. YES TO CUCUMBERS Facial Towelettes ($5.99/30 wipes @ target.com) – quickly remove dirt, makeup and everyday grime with these babies for when you’re on the go. Oil-free and hypoallergenic. How Can I Say No to Yes to Carrots? 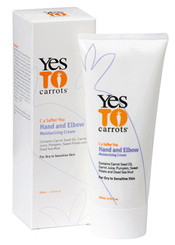 I am totally fascinated by this next new line, YES TO CARROTS. They get right to the point! The line is based on the power of vitamins and minerals and the Dead Sea. We have all heard of the benefits from the Dead Sea’s mud that you can’t find anywhere else. Their products incorporate all the above to nourish and detoxify the skin. And the name? Each contains juices from carrots, oranges and others they pack in each. My pick of the moment is the Hand and Elbow Moisturizing Cream ($9.99/6.76oz) and the Body Butter ($12.99/8.45oz). Even if I can’t give my insides nourishment everyday, at least I can with my outsides. Both for great prices @ target.com.